The Silverline Neoprene Mechanics Gloves have Neoprene knuckle protection and reinforced panels, providing the user with peace of mind when handling unknown or potentially dangerous objects. These grip work gloves are a great choice for automotive work and general handling tasks. With a durable construction and a snug fit, the Silverline Neoprene Mechanics Gloves protects from any dirt getting inside the glove, ensuring the gloves last longer and hands are protected and kept clean. Designed to be comfortable to wear with breathable fingers and a synthetic suede palm that allows for full dexterity, the Silverline Neoprene Mechanics Gloves can be worn for long periods of time whilst still remaining comfortable. The gloves have an adjustable elasticated closure to achieve a personalised fit. 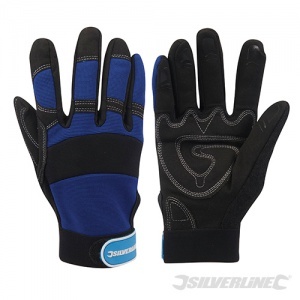 The Silverline Neoprene Mechanics Gloves are supplied in a universal size - "Large" - that should fit most. 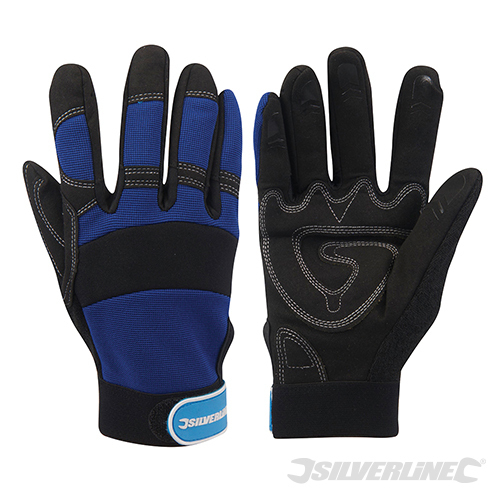 The Silverline Neoprene Mechanics Gloves are supplied in pairs.